Mr X Stitch, aka Jamie Chalmers, is a 37-year-old walking contradiction. The IT project manager looks like a cross between Hulk Hogan and a Hell’s Angel, likes to listen to dubstep, electro, garage, punk and drum and bass and is chairman of the Milton Keynes roller derby division. Oh yeah, and he’s a member of the Embroiderers Guild and absolutely loves to sew. Here’s what he has to say about one of his favourite pastimes. Black Cat Originals (BCO): So how did you fall into cross stitching in the first place? Mr X: I was going on holiday with my then-wife to Canada and I wanted something to do on the plane. We went into a haberdashery shop and I saw this cross stitch of an art nouveau head, which I thought would be fun. When I got to Canada and I started to have a go I found it to be rather nice, quite a pleasant, relaxing, meditating thing. BCO: What else appeals to you about the art? Mr X: I’ve always been a bit of a geek and used computers to make things. I can’t draw, I’m not that talented really. Essentially cross stitch is pixelated. It was only when I found this computer program I could make my own patterns. As I’ve done more pieces I’ve developed. I made a cross stitch for a boy called Rex who was having a christening. 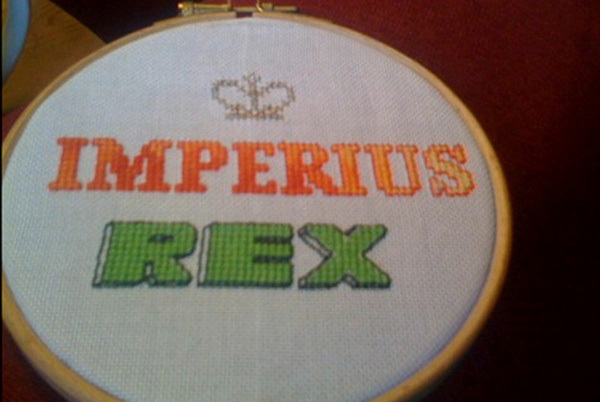 It said Imperius Rex. I didn’t think that much of it but the parents said – and still say now – that it was the best christening gift they got. I always like that play on words, it’s how I can make things that reflect people’s personalities. I love making gifts for people. Things like cross stitch and embroidery, lots of people say it’s for your grandmother, which is reflected in a lot of the patterns out there. But I can take a pattern and mash it up and give it to someone. BCO: So how difficult is it to get started? 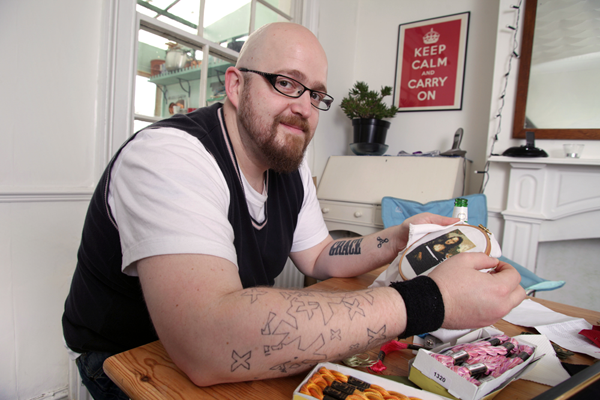 Mr X: I call cross stitch a gateway craft – it gets you onto harder crafts. I’ve taught people from eight to 80 to cross stitch and it’s a bit hectic for five minutes and then they get it. I’ve taught grandmothers to do it, which is a great honour. I don’t go around the country teaching people to cross stitch but I wouldn’t mind travelling around passing on the craft. It takes five minutes and then we sit around gassing. I went to the Clothes Show Live in December, which was a bit strange. The event’s about consumption not production so there would be models and people who wanted to be models and then this little oasis where people could hang out and do some cross stitch. BCO: What kind of reactions do you get from people when they find out you’re a cross stitcher? Mr X: Older people can be a bit more reserved. I do a lot of stitching on the train and I used to be shy about it, but now I don’t care so much. I’m aware that I’m a bit unorthodox and a bit of a novelty. As a guy, I struggled in the early days to find cross stitch that I wanted to do but I’m now trying to come up with some patterns that will encourage more men to take it up. Lots of men do it quite covertly, quite quietly but I’ve got some patterns that they aren’t going to feel strange about doing. I’ve had some men say I’ve inspired them and it’s such an honour when that happens. I think I am on a mission to change attitudes to cross stitch. It’s good for the soul, it just chills you out. Creating things is really important for people’s development, I just want to stop them thinking that it’s not for them. BCO: Does it help with the ladies at all? Mr X: I think people like me because they see what I’m doing and trying to do. I’ve developed a few fans and get some messages on Facebook. I like women – it’s nice to be well thought of! BCO: Let’s talk about the Yorkshire Show last year. 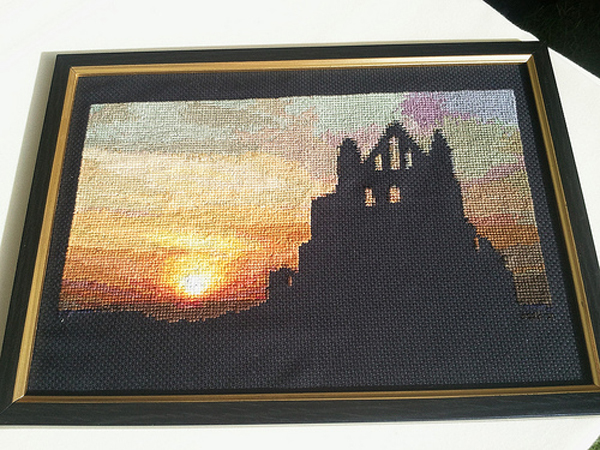 Do you feel robbed that you didn’t win with the Whitby Abbey cross stitch? Mr X: Competitions have a specific crafting criteria. I created this cool-looking art piece and only had it in the frame at two in the morning just before the show. Competitions are point-scoring exercises – it’s not always about the content. It’s about the quality of the stitching on the finished piece, that kind of stuff. Competitive crafting is on a different level to doing it for pleasure. Part of me wants to rise to the challenge and want to be better and I will have another go, time permitting. I want to try Japanese embroidery. You only have 37 types of stitching and it’s the most disciplined form of embroidery because you’re trying to make perfection. BCO: What’s been the highest point of your stitching career so far? Mr X: I had a really interesting week in July last year after agreeing to do a show in Milton Keynes. I’ve had work exhibited in America and Europe already but it was a big deal having an exhibition in my home town. BCO: And what’s next for Mr X Stitch? Mr X: I don’t really have any major plans for the future. I’m doing an exhibition and going to the Stitch and Craft Show in March. I’m also hopefully helping an artist friend of mine do an exhibition in Paris. That’s all, folks! If you want to get some more Mr X action check out his book, Push Stitchery, which came out last year, or while away a few hours on his website. Are you a chap who crafts? Are you loud and proud about your hobby or do you hide beneath the bed covers with your needle and thread? Get in touch!